At about the age of seven I discovered Matthew Arnold's poem The Forsaken Merman. It's a romantic poem based on a Scandinavian legend about a merman who married a human woman and took her to his home beneath the waves. They had children, and were happy - until one day the woman heard the church bells calling people to prayer, and she began to fear that she would lose her immortal soul. She left her family for a visit to her old home - and never returned. Day after day the merman and his children rose in the waves and called to her. The merman even went to the churchyard and looked into the church and called again. But she did not respond. They had lost her. I loved the rhythms and sounds of Arnold's poem, and the whole idea of mermaids and their undersea world - and most of all I loved the sadness of this story. 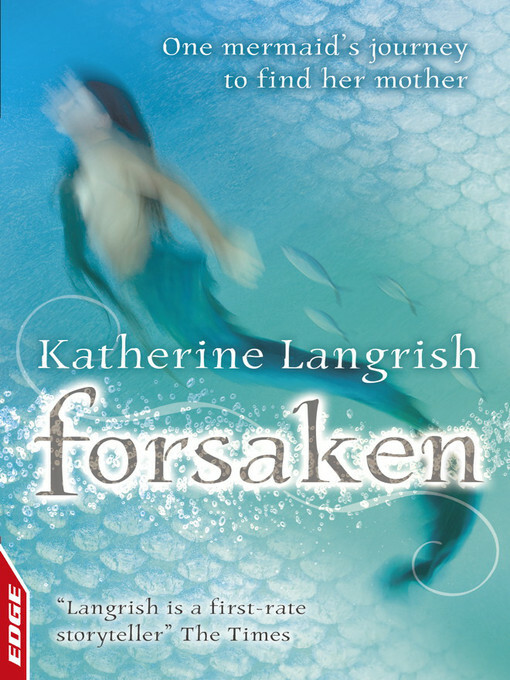 So when I heard that Katherine Langrish had written a story imagining what might have happened if one of the merman's children had gone to try and fetch her mother back, my first thought was that I wanted to read it, and my second was to wonder whether I could cope with a happy ending. I'm glad to report that I could. I loved this book, which is very short but by no means a simple read. The writing is beautiful. It's full of the same kind of romance as Arnold's poem, but Katherine Langrish imagines the life of the mer-folk in far more intimate detail; and her focus on one child allows the reader to feel the intensity of their grief and loss. This story in fact packs a much stronger emotional punch - so it's just as well it ends happily. Any other ending would be too awful to contemplate after we have struggled with Mara, the desperate eldest daughter, as she leaves her natural habitat and drags herself in agony along the stony road. Mara has spent time pondering her mother's soul. She doesn't know what a soul is, and feels no need of one herself, but she understands how important it is to her mother. By the time she reaches the church where her mother is at prayer, she knows she cannot live much longer out of her element, and with her last strength she enters the building. What happens next is terrifying and heartbreaking. But love wins through and brings the story to a perfect end. Published by Franklin Watts (Rivets), 2011. I too love the original Forsaken poem and hadn't reached out to read Katherine Langrish's book because I didn't want to meet such sadness. I'm very glad that quality is there still, but thanks to your hints about the perfect ending, I'll feel happier opening the covers next time I come across it. Have to go to the library on Monday so will try searching or ordering Forsaken there! I regret to say I haven't read the Arnold but will do so now so that I can enjoy Kath's book too, which sounds marvellous!